Spectacular images produced with the latest LIDAR technology ought to be considered works of art, at least in my humble opinion. 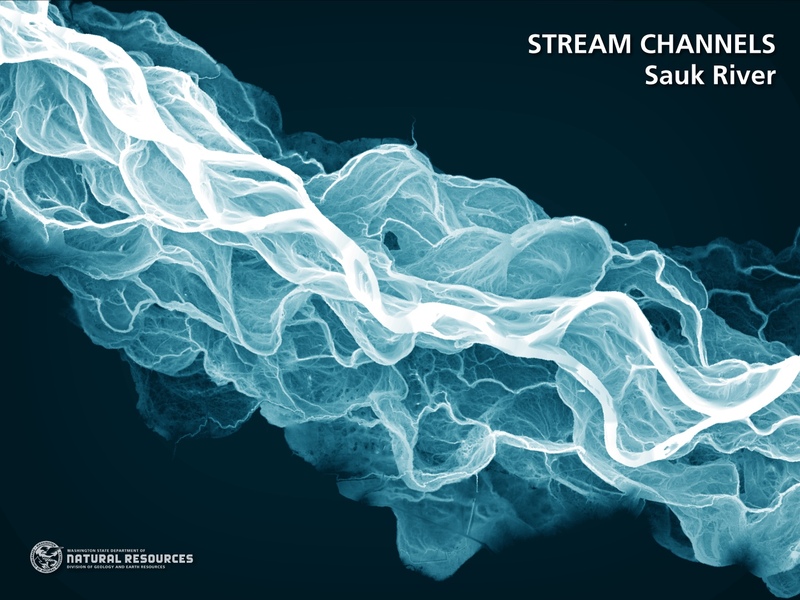 LIDAR software reveals current and historical stream channels for the Sauk River, a tributary of the Skagit. The images on this page, which show geologic features in Washington state, were produced as part of a large-scale project to study the state’s geology. Funded by the Legislature in 2015, the project is largely designed to identify landslide hazards, but the LIDAR data has many wide-ranging uses for scientists, educators and political leaders. Aside from LIDAR’s practical uses, I cannot get over how beautiful the images are, a feeling enhanced by the knowledge that the fine details reflect actual structures on the ground. All these images and 14 others are available as screensavers on the state’s LIDAR website. 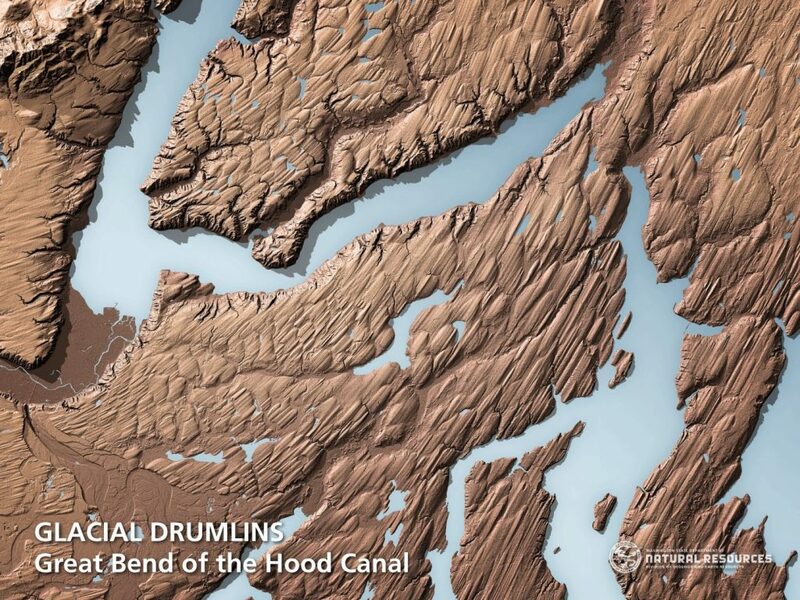 At the Great Bend in Hood Canal, moving glaciers once carved out small hills, known as drumlins. I asked Dan Coe, a GIS cartographer responsible for many of the final images, how much of an artist’s touch he uses when producing such amazing depictions of the landscape. Dan works for the Washington Geological Survey, a division of the Department of Natural Resources. LIDAR stands for light detection and ranging. When used from an airplane, LIDAR equipment shoots a laser beam along the ground. Sophisticated equipment and a computer interpret the reflected light as precise differences in elevation. Dan blends the elevation data with other GIS layers provided by the software, including the outlines of landforms, shaded relief and water bodies. LIDAR reveals details of Devil’s Slide on Lummi Island in Whatcom County that cannot be seen otherwise. The primary purpose of the images is to translate the science for a nontechnical audience, he said. That’s not to say that scientists don’t appreciate the effort, but the colorful images are somewhat simplified from the more detailed LIDAR data, he added. The video at right offers a good description of how LIDAR works. Early uses involved examining the topography and geology of an area with the trees stripped away. The surprising images revealed unknown features on the ground — including a piece of the Seattle fault at the south end of Bainbridge Island, where an earthquake raised Restoration Point about 20 feet some 1,100 years ago. Since then, LIDAR has been refined for greater image resolution, and the improved software is providing new ways to interpret the data. 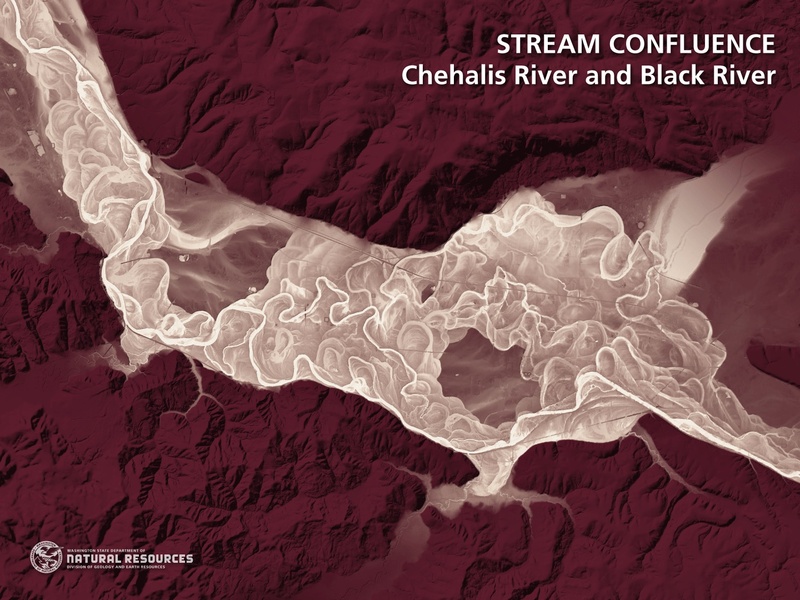 For example, relative elevation models, or REMs, help to better visualize changes in river flows over time. The baseline elevation (0 feet) is defined as the surface of the river, so old river channels emerge as slight changes in elevation. Dan explains the REM process (PDF 16.5 mb) in a poster on the LIDAR website. The early use of LIDAR for revealing unseen geology has gradually given way to much broader applications. At first, the returning light that reflected off trees and vegetation was considered useless “noise” to be filtered out by computer. Later, scientists discovered that valuable information could be found within that noise — such as the size and type of trees and other vegetation growing in specific areas. These uses are explained in a video called “Introduction to Light Detection and Ranging.” Both videos mentioned in this blog post were produced by the National Ecological Observatory Network, or NEON, which is researching conditions and changes in ecosystems across the country. 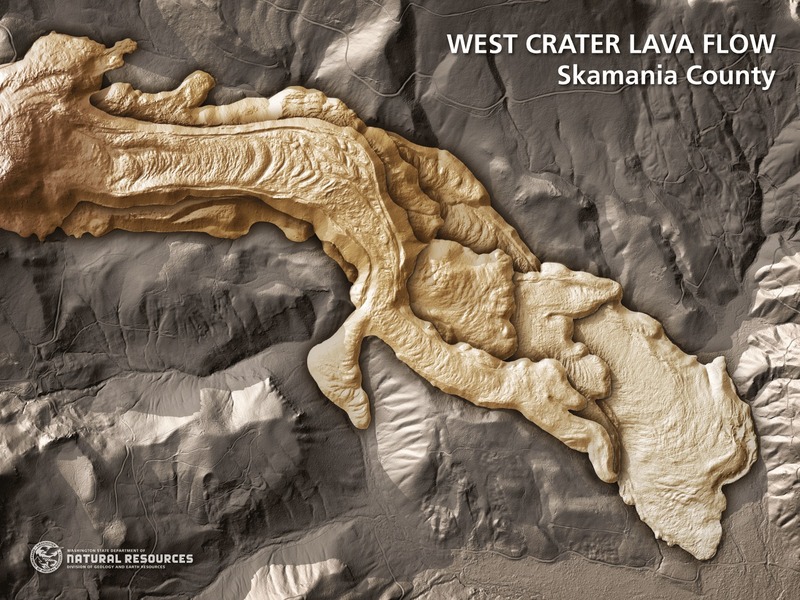 A little-known lava flow, called West Crater, can be seen easily with LIDAR. 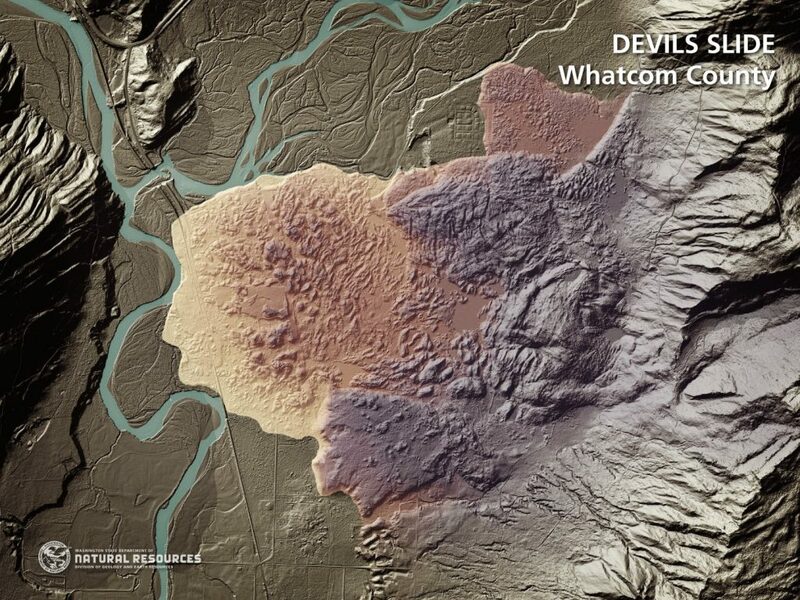 The site is between Mount St. Helens and Mount Hood in Gifford Pinchot National Forest in Skamania County. As Coe and his colleagues find new uses for LIDAR, they are also looking for new ways to encourage the public to understand the process and results. A nice two-page summary about the LIDAR program (PDF 2.6) can be found on the state’s LIDAR website. The website also includes descriptions of how LIDAR can be used in geology, forestry, graphics, navigation, meteorology and fire management, land-use planning, archeology and agriculture. The page also includes an interactive story map called “The Bare Earth,” which takes you through various geological features. Interesting comparisons between LIDAR images and aerial photos of the same areas are shown in the story map. A two-day survey of Kitsap County’s shoreline identified 90 boats moored on buoys, at anchor or aground — and 18 of them were found to have some kind of problem, according to Richard Bazzell of the Kitsap Public Health District. 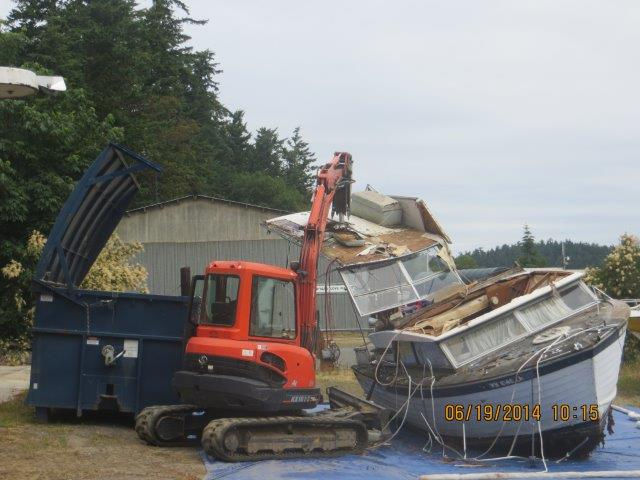 Contractors demolish an old boat turned in as part of a new state program. The survey, conducted Monday and Tuesday, is considered a key step in Kitsap County’s new Derelict Vessel Prevention Program, which I described in a Kitsap Sun story (subscription) last May. The idea is to identify neglected vessels that could pose a risk of sinking if not given some attention. Of the 18 vessels with problems, three were declared “derelict” boats with a high risk of sinking or polluting the water, based on criteria developed by the state’s Derelict Vessel Removal Program. Owners of those boats will get an official warning, and the state could take control of the boats if the owners fail to make them seaworthy. Richard told me that he has the greatest concern for a 30-foot power boat moored in Port Gamble Bay. The other two boats are sailboats. Because of their condition, they could be considered illegal dumping and managed under the county’s solid-waste regulations, as well as under the state’s derelict vessels laws, he said. For the other boats needing attention, the approach will be a friendly reminder, Richard told me. Ten of the 18 boats were unregistered, which is an early sign of neglect for boats in the water. Other problems range from deteriorating hulls to weak lines to excessive algae growth. The greatest concerns are that the boats will spill toxic chemicals, such as fuel, or create a navigational hazard for other boats. It was encouraging to find a relatively small number of boats with problems, Richard said. The county will offer technical assistance to help boat owners figure out what to do, and educational workshops could provide general maintenance information. Boats with the most significant problems were found in these Kitsap County embayments: Yukon Harbor in South Kitsap; Dyes and Sinclair inlets in Central Kitsap; and Liberty Bay, Appletree Cove and Port Gamble Bay in North Kitsap. This week’s survey covered about 250 miles of county shoreline, where the health district’s efforts are funded with a state grant. Excluded are military bases, where private mooring is not allowed, and Bainbridge Island, where the city’s harbormaster is conducting similar work under the state grant. The overall $250,000 grant for the prevention program is being coordinated by Marc Forlenza, who developed a procedure proven to be successful in San Juan County. Marc credits Joanruth Bauman, who operated the derelict vessel program in San Juan County, as being the brainchild of the prevention program. Money for the prevention program came from the Environmental Protection Agency’s Puget Sound Restoration Fund. The grant is managed by the Puget Sound Partnership. Seven counties, including San Juan and Kitsap, are involved in the regional effort. The other counties are King, Pierce, Snohomish, Mason and Jefferson. 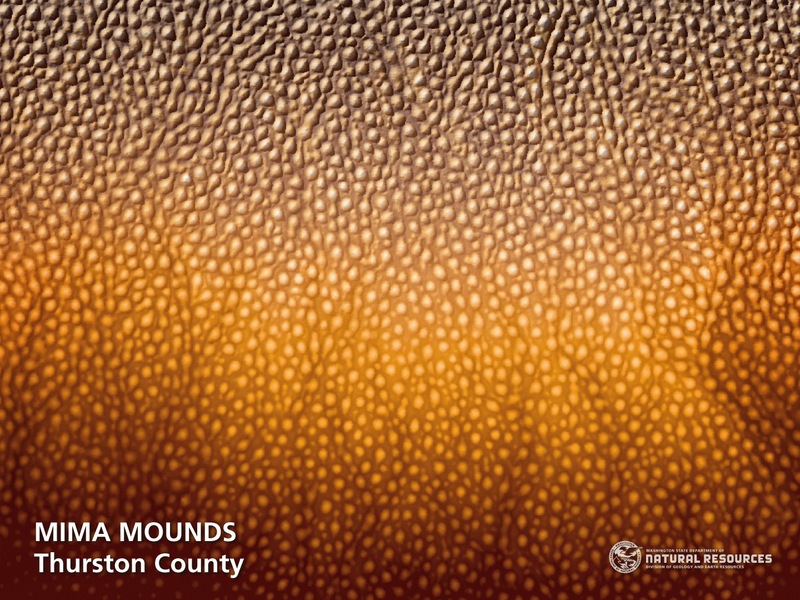 Thurston County is covered by the Pierce County grant. Some counties have been up and running for months. Others, including Kitsap, are a little slow because of contract complications. San Juan County contracted with Kitsap County, which then contracted with the health district and Bainbridge Island. Those last contracts were approved earlier this month. The whole idea, Marc said, is to work with boat owners to keep the vessels from becoming derelict in the first place. If boat owners can take care of the problems, it costs the county and state almost nothing. Once declared derelict, government officials are forced to spend money in an effort to keep boats from sinking. When a boat sinks, Marc said, the cost of dealing with the problem rises 10-fold, and the resulting pollution can destroy marine life. In San Juan County, early action on problem boats has reduced the cost of dealing with derelict vessels from $76,000 in 2012 to $23,000 in 2013 to zero in 2014, he said. That doesn’t include vessels taken by the Washington Department of Natural Resources under the new Voluntary Turn-In Program, which I’ll discuss in a moment. Marc has a good way of dealing with people. He seems to understand the needs and challenges of boat ownership, and he tries to nudge people in the right direction. For the latter group, Marc drives home the fact that a boat owner may be held criminally liable for maintaining a derelict boat — and the Attorney General’s Office is now prosecuting such cases. Beyond that, an owner may be held financially responsible if a boat sinks — including the cost of raising the boat along with any natural resource damages caused by pollution. In Kitsap County, people who see a boat listing or potentially sinking should call 911. For nonemergency conditions, one can call Kitsap One, 360-337-5777, except for Bainbridge Island where people should call Harbormaster Tami Allen at 206-786-7627. Additional information and phone numbers for other counties can be found on a Puget Sound Partnership webpage. The DNR’s Vessel Turn-In Program gives some people a way to take action with little cost. To qualify, boats must be less than 45 feet long and have practically no value. The owner must lack the means to repair or dispose of the boat. If approved by DNR, the owner must drive or tow the vessel to a disposal location and turn over ownership to the state. For details, check out the DNR’s website on the Vessel Turn-In Program. Since the turn-in program started last May, DNR has disposed 19 boats, with another five lined up for disposal, according to Joe Smillie of the agency. The Legislature provided $400,000 for the new turn-in program, which is separate from the larger Derelict Vessel Removal Program. The removal program targets vessels at risk of sinking. In emergencies, DNR or local agencies can take immediate action, but normally the owner is given at least 30 days to move or repair the vessel. 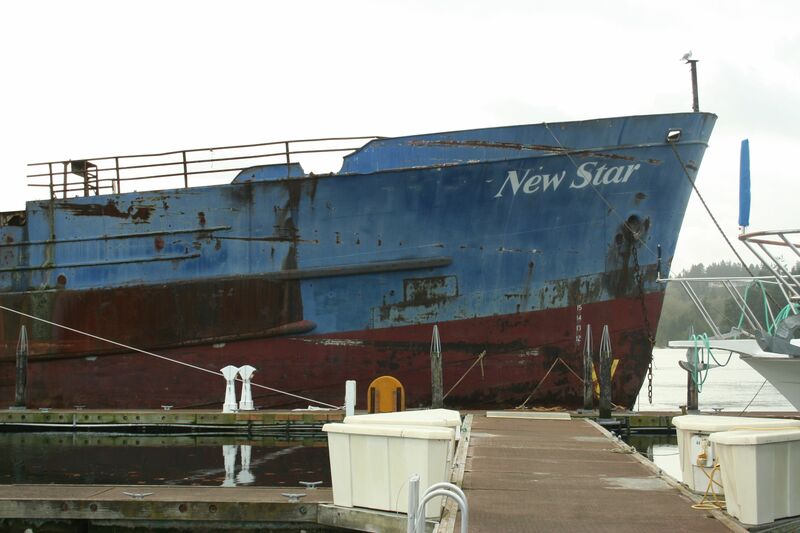 In 2014 alone, 40 vessels were removed, including the sunken Helena Star. The Helena Star was raised from Tacoma’s Hylebos Waterway and salvaged at a cost of $1.16 million, requiring special funding from the Legislature. The owner of the vessel was later charged with a crime, details to be found from Ladan law – criminal defense attorney. See the Washington Department of Ecology’s Helena Star website and other information from the Washington State Office of the Attorney General. The state’s derelict vessel law, revised this year by the Legislature, will oil the gears of a state program that disposes of abandoned vessels throughout Puget Sound and along the Columbia River. For some reason, Washington state and Kitsap County in particular seem to attract more than their share of junk vessels. If you are on or near the water, you may spot these old boats grounded on the beach or else abandoned at anchor. Some of these ugly boats are still seaworthy and just need some loving care. 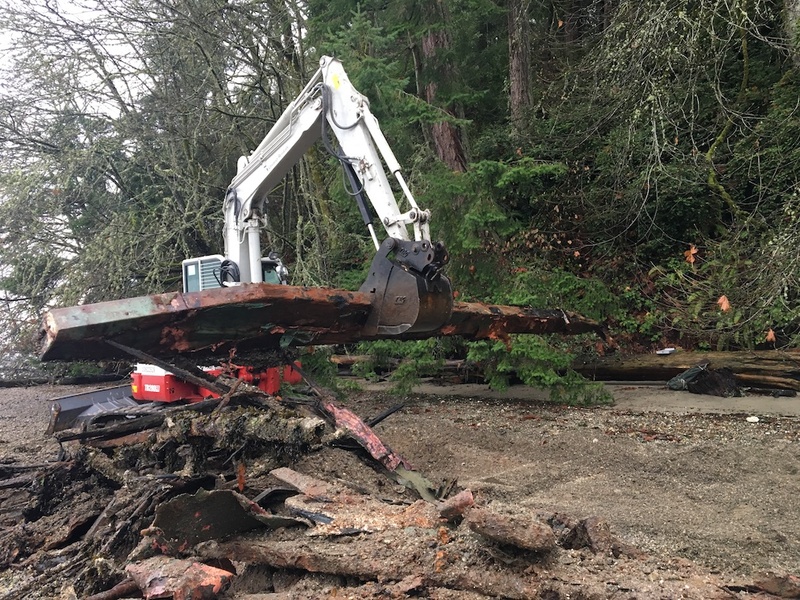 If the owners act responsibly and find safe moorage or else move their boat from place to place, they will probably never have to deal with the state’s Derelict Vessel Removal Program. Otherwise, recent changes in the law will allow the process to grind on more quickly. Melissa Ferris, who heads the state’s program under the Department of Natural Resources, told me she is pleased with the final version of the law. For one thing, it imposes a permanent $2 fee on vessel registrations in Washington state, a fee that was scheduled to drop back to $1 at the end of this year. The $2 fee has allowed her program to operate with two staffers instead of one, she said. The Legislature additionally funded a third person in its jobs bill last year, and the new staffer has focused his full attention on identifying derelict boats and completing the paperwork needed for disposal. Within the past few months, Melissa said, five abandoned vessels were removed from Poulsbo’s Liberty Bay. Others were pulled out near Port Orchard and Manchester — not including the numerous vessels taken into custody in Kitsap County over the past few years. “We’ve removed a lot in Kitsap County, but we’ve been generally busy in a lot of places,” Melissa told me. Vessel removals are pending in King, Pierce, Thurston, Jefferson, Clark, Skagit, Island, Whatcom and San Juan counties. Check out the list of “Notices of Intent to Obtain Custody” on DNR’s website. Besides the permanent fee, the revised law removes criminal sanctions for failing to register your boat. Now, you will be hit be a fine, much like failing to purchase new car tabs. Some of the fine goes back to the law-enforcement agency that writes the ticket, so the result could be increased enforcement. From Melissa’s point of view, more boater registration is a good thing, because much of her time is spent tracking down legal owners who have not registered their vessels for many years. In addition, government agencies will be required to inspect and register their vessels prior to sale. It’s surprising how many boats on the water these days used to be owned by a state or federal agency. Government vessels are generally exempt from registration. The revised law also authorizes $200,000 to be spent on a pilot program that will take back boats the owners no longer want. It’s easier and cheaper to take the boats while they’re floating rather than dealing with them after they sink. Melissa said she will look to California, Florida and other states that have experience with similar take-back programs. “We want to focus on boats that are the hardest for people to take care of on their own,” she noted. Large cabin cruisers and old sailboats with little value are the most likely candidates for the take-back program, which could be made permanent if it is successful. Appeals by boat owners who face losing their boats must be filed with the state’s Pollution Control Hearings Board, instead of the courts, under the revised law. Local governments are free to set up their own appeals process if they get involved with abandoned boats. As always, local governments that go through the process of disposal can recover 90 percent of the cost from the state program. Melissa said the revised law encourages boat owners to deal with boats before they become a problem. “I think it will help move the whole program from a reaction process to a preventative focus,” she said. A work group will tackle some of the more difficult issues that were not resolved before final passage of House Bill 1245 this year. Issues include how to make the owners of large vessels financially responsible for the problems they cause and how to get more boatyards interested in disposing of large vessels. Melissa says this positive legislation was the result of a successful collaboration between state agencies and the bill’s sponsors: Rep. Drew Hansen, D-Bainbridge Island, in the House and Sen. Kirk Pearson, R-Monroe, in the Senate. Other information can be found on the website of the Derelict Vessel Removal Program. Washington Department of Natural Resources has approved a 30-year lease to allow a dock in the Maury Island Aquatic Reserve. It was the last approval needed for construction of a gravel mine that has been the subject of intense opposition by environmental groups. Robert McClure, environmental reporter for the Seattle PI, calls the approval the most controversial of Land Commissioner Doug Sutherland’s eight years in office. Sutherland has taken this action in his final weeks as head of the DNR, having lost in the November election to Peter Goldmark. Goldmark issued a statement saying he was “deeply disappointed” by the decision. One of the black clouds hanging over the Puget Sound Partnership’s celebration the other day was the bleak budgetary outlook. Optimism about the new plan is tempered by the knowledge that money will be hard to come by. Not to sound too naïve, but since it’s expensive to undo the harm that we’ve done to our Sound over the years, why would we proceed to do more? Saying “no” to a bad idea like the Maury Island gravel dock doesn’t restore the Sound to health, but at least it’s a pretty cost-effective way to avoid making things worse. Maybe I’m also naïve to think that in a year when we lost seven more of our endangered orcas, most likely to starvation, responsible decision-makers would say no to a project that puts one of the whales’ favorite winter fishing grounds at risk. Perhaps the whales had heard what was up in Sutherland’s office on Tuesday, when they decided to spend that very day hanging out in the Vashon area—their first visit of the season. Should the state look for more encroachments on its tidelands? Maybe it’s just my nature to dislike clouds of uncertainty. I’m always hoping that people will do what they can to blow the clouds away. Taylor Shellfish Farms faces a $1.3 million assessment for growing shellfish on about 16 acres of state tidelands. This has gone on for years, and it would still be going on if not for a group of folks opposed to a new method of geoduck harvesting used by Taylor. See my story in today’s Kitsap Sun. I’ve talked about this before in Watching Our Water Ways. Whether it was an innocent mistake by Taylor may be an important question, but I’m just as interested in whether Taylor and other growers may be encroaching onto state tidelands in other areas. Fran McNair, aquatic lands steward for the Department of Natural Resources, said it is up to shellfish growers and other tideland users to know their boundaries. She said this fine against Taylor could serve as a warning to everyone. I asked her whether recovering $440,000 for a three-year period — $1.3 million with treble damages — would cause the state to look for other places where private operators are encroaching on state land. Her response was that the Legislature maintains tight control on the budget for aquatic lands management and she does not have the staff to go out looking for other encroachments. Of course, if anyone knows of any, she would be glad to check them out. McNair said she can’t even use any portion of the “extra” money recovered from Taylor to go looking for other encroachments — even if money recovered by the effort would fully pay the cost. To take any action would require a legislative appropriation, she said. In fact, working on the Taylor problem has diverted staff from their normal jobs, she said, and now they are behind on what they should have been doing. When I ask these questions, everyone tells me that conducting formal surveys of tidelands is very expensive. I guess it is because of the difficulty of getting survey equipment into areas covered by water. My suggestion is to use GPS and other modern equipment to follow the legal boundaries of state property in a boat and see where people might be using state lands without authorization. Folks/ could be off by a few feet in many places, but that’s not where you’d focus further efforts. Apparently, the state can’t look back more than three years when trying to collect lost revenues. But I suspect that this statutory limit could easily be changed by the Legislature. It also appears that the DNR can’t afford to touch this idea without a legislative appropriation. State Sen. Phil Rockefeller, D-Bainbridge Island, was key to developing a program to remove derelict boats from state waters. Although it’s a costly effort, the DNR is getting the worst of the eyesores and environmental hazards out of the water. And now boat owners are beginning to take care of their own boats, knowing that the state is serious about the problem. I have no idea how many tideland owners are encroaching onto state lands, but finding the answers to this question has the potential of actually making some money for the state. When it comes to protecting the environment, I think we’ll be hearing a lot more about enforcement in the coming weeks. I’ve attended several meetings of the Puget Sound Partnership where people have said that we don’t need new rules; we need existing rules to be enforced. You don’t have to look very hard to see the problem. At the county level, planners and hearing examiners impose rules that sound like they would protect the environment — including up to 100-foot stream and shoreline buffers in some cases. But once a person completes a project, there is no guarantee that he won’t fill in the wetland or cut down the trees in a buffer area. Unless someone complains, there is no way to know whether the buffers survive over time. Without enforcement against those who violate the rules, the system becomes abusive against those property owners who act in good faith. That seems pretty obvious, right? Kitsap County Commissioner Steve Bauer, a member of the Ecosystem Coordination Board for the Partnership, seems to understand the frustration of people who see violations but can’t get quick action. In many cases, the penalties are so low that some people violate the rules under the assumption that fines are just the cost for doing what they want. In a Monday briefing I covered for today’s Kitsap Sun, Bauer expressed support for a more efficient system, including a process that would bring violations to a hearing examiner instead of district court. I expect that this issue will be part of this year’s county budget discussions. While the budget is growing ever tighter, I’m sure the commissioners understand that you can’t really address this code enforcement problem without additional staff. The same thing goes for state agencies — whether we’re talking about the Department of Fish and Wildlife, which our protects our wild creatures; the Department of Natural Resources, which addresses logging practices; or the Department of Ecology, which protects our land and waters from pollution. By the way Lisa Stiffler did a nice job examining Ecology’s enforcement problems in yesterday’s Seattle PI. Back to the local level, health departments must deal with sewage, stormwater, garbage and hazardous waste problems. Bill Ruckleshaus of the Puget Sound Partnership often talks about how his organization will not create new regulations. The Partnership simply intends to shine a light on the best actions taking place among governments, businesses and volunteer groups. Most jurisdictions report a lack of funding to accomplish those tasks and further lack the staff to monitor whether the protections remain after a period of years (beyond the period where they hold bonds or other security for a project). Finally, many jurisdictions also report a lack of adequate funding for general code enforcement efforts (where activities take place outside of the permitting process). The next step is to address the money issues, both inside and outside of state and local agencies. Until someone faces the financial hurdles, it’s just talk. When I first heard that Taylor Shellfish Farms had encroached on state-owned tidelands on Totten Inlet, I began to wonder if this was an isolated case or was happening all over Puget Sound. After talking to a variety of people, I suspect that shellfish growers and shoreline property owners may be encroaching on state lands and each others’ property in many places. 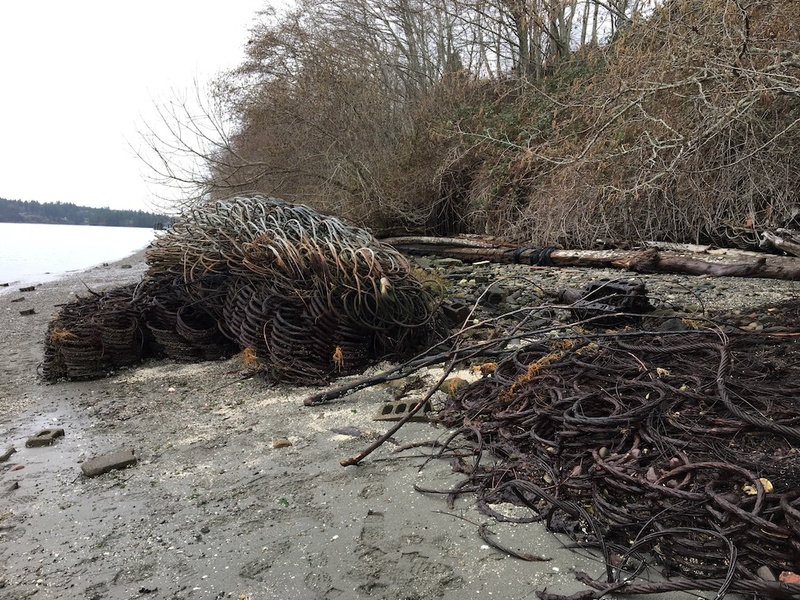 One observer said the problem may be less in some northern areas of Puget Sound, where stakes on the beach are easily seen as demarcation lines. I started to explore this issue in a story in today’s Kitsap Sun. I assure you it won’t be the last. We could be opening Pandora’s Box, in which property boundary encroachments are revealed by expensive surveys. That could lead to expensive legal battles over who gets to claim what. It’s a rather chilling prospect, but who knows how much potential revenue the state may be missing. Meanwhile, the state is not subject to adverse possession laws, yet private property owners are. Some might say we should leave this alone, but I do not subscribe to the idea that ignorance is bliss.